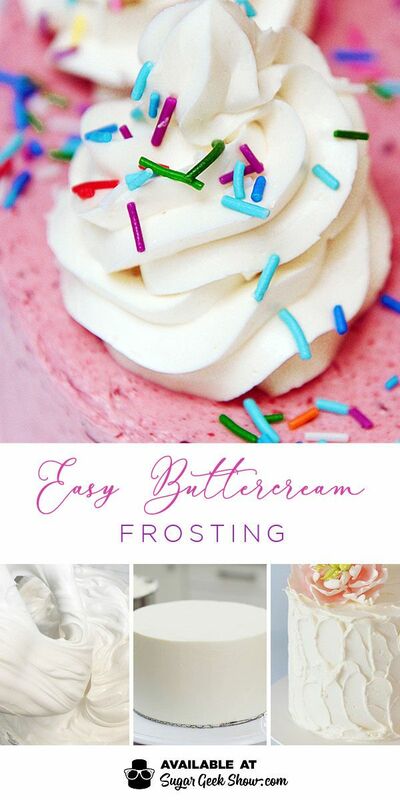 This is the easiest buttercream frosting recipe out there and tastes incredible! Technically a mock swiss meringue buttercream that requires no heating of the egg whites. Light, creamy, and not too sweet. It’s my go-to recipe for all my cakes and cupcakes. It pipes beautifully and works well under fondant. The first buttercream I ever made was from an old Wilton recipe book. Powdered sugar, shortening, and vanilla. I struggled SO hard to get my edges smooth and crisp like the photos I saw in the fancy cake decorating books but I always ended up with mega cake fails. It wasn’t until I went to pastry school in 2010 at Oregon Culinary Institute that I first heard of other kinds of buttercreams. I’ll never forget the day we made Swiss Meringue Buttercream and we had to frost our cake by holding it in one hand and icing the cake with a spatula in the other. NO turntable! I was like, there is no way this is going to work. But I lifted that cake up and began frosting as my chef instructed and I could not BELIEVE how smooth it went onto my cake! Not too sweet, super silky, melt on your tongue goodness!! For the next 6 years I only made SMBC for my cakes which involves a lot of heating of egg whites, whipping, cooling and repeat. I WISH I had this recipe back then! It’s so much easier! How much buttercream frosting do I need? This buttercream frosting recipe makes a LOT (12 cups) which basically fills the bowl of a standard KitchenAid mixer. The reason for this is because when your mixing bowl is filled to the top, it’s easier to get all the air bubbles out. You can freeze leftover buttercream or store it in the fridge for a week. Just bring to room temp and mix with the paddle a few minutes to make it creamy again before use. This buttercream frosting is the recipe I WISH I had when I was making 5 wedding cakes a weekend. Now it’s the only buttercream frosting I use and my clients love it. Way better than the super sweet frosting I was used to seeing on cakes. Pasteurized egg whites usually come in a box or a bag and are in the egg section of the grocery store. They will say pasteurized right on the box. 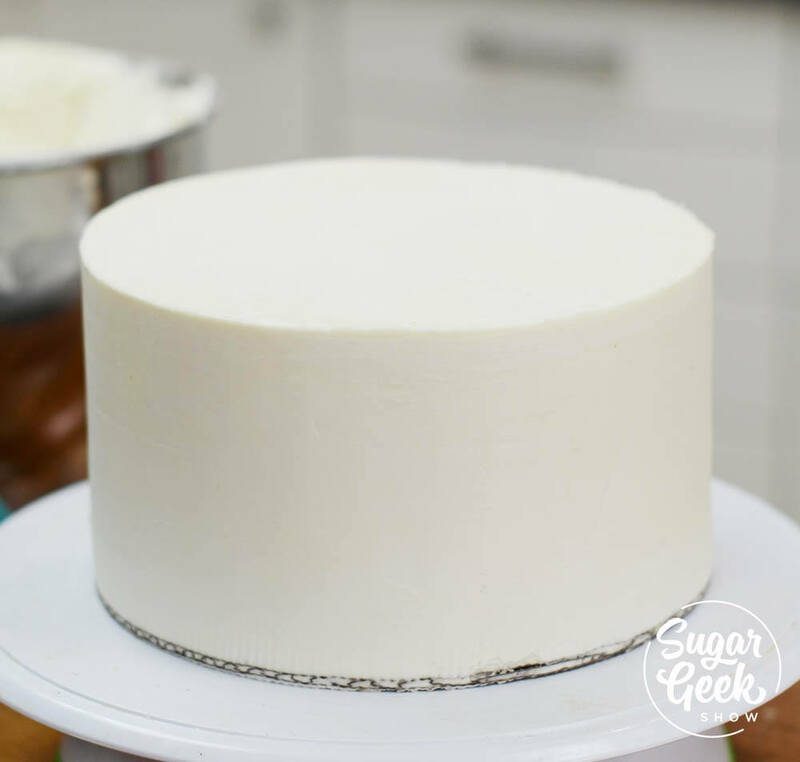 If you can’t find pasteurized egg whites then you can use regular egg whites but will have to use my swiss meringue buttercream recipe instead so that you can heat treat the egg whites first. 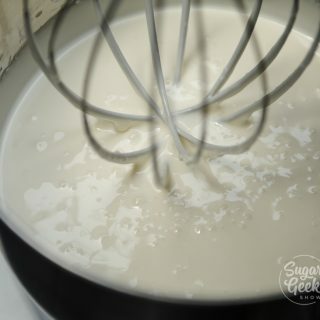 Place your egg whites and powdered sugar in the bowl of your stand mixer and whisk on low to combine. Increase speed to high and whip 5 minutes. To increase the whiteness of your buttercream, add one drop of violet food color to counteract the yellow in the butter and use clear vanilla extract instead of brown. How long does buttercream frosting last? Because of the large amounts of sugar in buttercream frosting, it can be left at room temperature for 2 days but I always recommend you refrigerate leftover buttercream when not in use to extend the life of the buttercream. If you are not going to use buttercream for more than a week you can freeze it for 6 months or more. To use frozen or refrigerated buttercream, let come to room temp then mix on low with the paddle attachment to make it creamy again. Do not whip or you can incorporate too much air. If your buttercream frosting has been sitting at room temperature for more than a day, mix with paddle attachment before use. Buttercream tends to get spongy after 24 hours and looses it’s creamy texture. Is this buttercream frosting good for using on wedding cakes? Yes! I love using this buttercream frosting for my wedding cakes. It can even be covered with fondant. Always chill your cakes before covering in fondant. When I make my cakes, I keep them refrigerated for stability. Once the cakes are delivered, the buttercream comes to room temperature and is soft enough to enjoy. Hard buttercream is not great to eat. 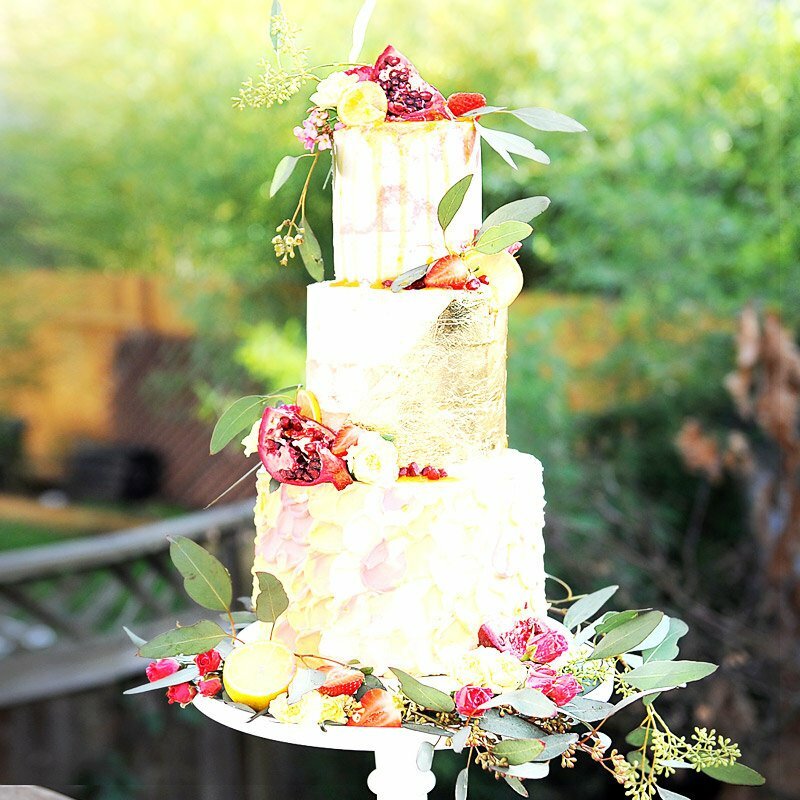 Learn to make this semi-naked wedding cake on the membership site. Any chef will tell you that a recipe is only as good it’s ingredients. Buttercream frosting is made of only a few ingredients. Egg whites (basically no flavor), sugar (sweetness but no flavor to speak of), butter and vanilla. Butter and vanilla is where you get your flavor from so the better your butter and vanilla, the better your buttercream frosting will taste. 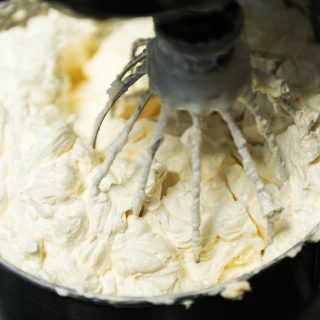 Now if you’re like me and you’re making tons of buttercream frosting for huge cakes, you don’t want to go full on plugra (the best butter ever) because it get’s expensive really quick but if you try to go super cheap and use really low-quality butter or shortening, you’re going to taste that greasy aftertaste in your mouth. Not good. There is a debate about whether or not you should use salted or unsalted butter for your buttercream frosting and I have seen people do both. I personally prefer to use unsalted butter so that I can control the amount of salt in my buttercream frosting. The amount of salt in one lb of salted butter is in my opinion much too strong for a batch of easy buttercream. Learn how to make beautiful piped buttercream flowers and sharp edges using acrylic disks from guest instructor Danette Zamora Short. Same thing with the vanilla. Vanilla is SUPER expensive right now thanks to a vanilla bean shortage so you have to be smart about. You might not want to go putting a vanilla bean into every batch but it don’t go leaving it out all together. I get my vanilla from Costco and get a pretty decent deal. 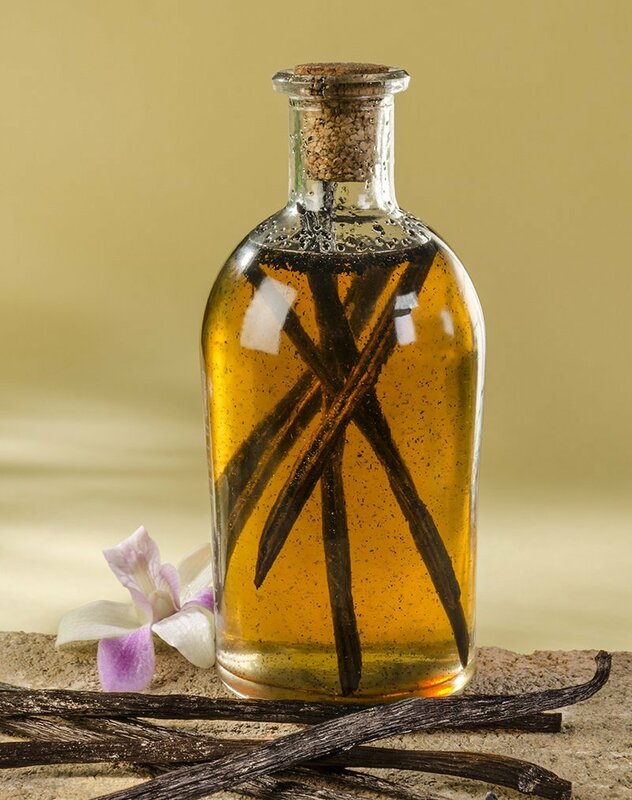 You can also supplement your vanilla with almond extract or you can try making your own vanilla extract from vanilla beans. You can use any type of flavoring for your buttercream frosting, Emulsions and extracts that are not “artificial” will always taste better. You can make chocolate buttercream frosting into a delicious chocolate version by adding in about 1/4 cup of your favorite cocoa powder. I like dutched cocoa powder because it has a nice rich chocolate flavor. You can also make a white chocolate buttercream frosting by adding melted white chocolate into the buttercream frosting. This makes a SUPER stable buttercream frosting that is a combination of buttercream and white chocolate ganache. Watch my video on how to make the perfect easy buttercream frosting! Best icing ever, Thanks !!!! Is the mixer bowl over another bowl because I know you said that we don’t have to heat the egg whites and sugar, so I was just wondering. Thanks. No it isn’t, the egg whites have already been heat treated when you buy them which is why it’s such a great time-saver to do it this way! Could you tell me the brand of the pasteurized egg whites. I would really like to try this because it seems so convenient. melted pink choc.wafers that I had added some melted coconut oil to thin it down. Well the choc. separated on the icing. Can this not be done on this kind of icing? I read that a white chocolate ganache with a 1:1 ratio of choc to cream is best. Also, the cake should be chilled for 15min before adding drip to help slow down the drip. I’ve found that for a white chocolate drip a 3:1 ratio (3 parts chocolate to 1 part cream) works best. A 1:1 ratio would be much too thin. It depends on the chocolate you are using. White chocolate yes, it is way too thin but dark chocolate is perfect. Can you freeze this icing and if so how long can you keep it for? Could I use a electric hand mixer instead and achieve the same results? Does this icing work well under fondant? Do you have a buttercream recipe with out egg whites, also incase we don’t have pasteurized egg whites, how long do they need to be cooked for over a double boiler . 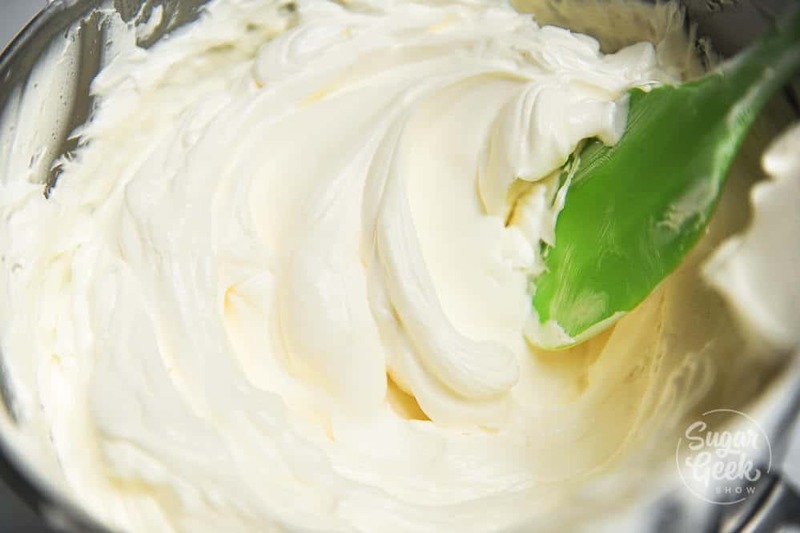 An easy Swiss meringue butter cream is one part egg whites, two parts fine sugar, and two parts butter, diced.. Heat egg whites and sugar til sugar is dissolved. Whip until cold. Add butter, one cube at a time. Mix until smbc is smooth and pipeable. Do you need to have the eggs whites at food temp or straight from the fridge in the container? Can we use normal egg whites? Only if you pre-heat them ahead of time to 110ºF over a double boiler as you would do when making a traditional SMBC buttercream. What can I use in place of pasteurised egg white which is not available here? Thanks. If you can’t find pasteurized eggs then you will need to make SMBC the old fashioned way by heating the egg whites first. instead of pasteurized egg white can i use meringue powder? How long can this be left at room temp? Big fan and love using your tutorials! I have tried this twice and each time is comes out soft, even after leaving it in the fridge to harden up it still soft in comparison to my SMBC. In the summer I have my kitchen at 60-65 degrees due to humidity. I really want this to work because it will save me soooooo much time. Really? that’s strange. This is the same as SMBC except that the egg whites are already pre-heated. Maybe just add a little more butter if you want it stiffer. Your recipe calls for 8 sticks of butter .. in my SMBC I use less… about half as much!!! I’m from Central Ohio. Where can I buy pasturized egg whites??? 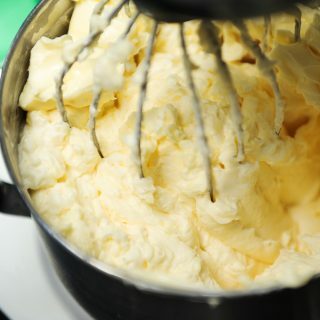 Can you substitute shortening for some of the butter like you would in an American buttercream to make it more stable? is this icing good for a naked cake version of a wedding cake? Someone mentioned crumbke icing to me? My first time making a naked cake and its for my daughters wedding trial run is this weekend. Wedding next weekend. You made it and it’s a bit soft will it work for a wedding cake? Yep! You can always pop it in the fridge for 20 minutes to firm it up a bit more 🙂 Always deliver it chilled. that’s a lot of butter, cant I make it and use half the recipe.. and or can I replace one lb of butter with shortening.??? Yes you can but your recipe might end up greasy if you use too much shortening. I use this recipe but do half butter and half hi ratio shortening and it comes out fabulous. Hi ratio shortening is a bit expensive though. Thanks for your recipes. Love your blog! can I make half the recipe?? and or can I also make the full recipe and use half shortening? Yes you can half the recipe, you can use shortening but if you use too much the recipe will be greasy. You can also make a full batch and just freeze the leftovers. I felt like it was still too sweet. Can I decrease the sugar without impacting the result? Buttercream is going to be sweet 🙂 It’s mostly sugar after all. 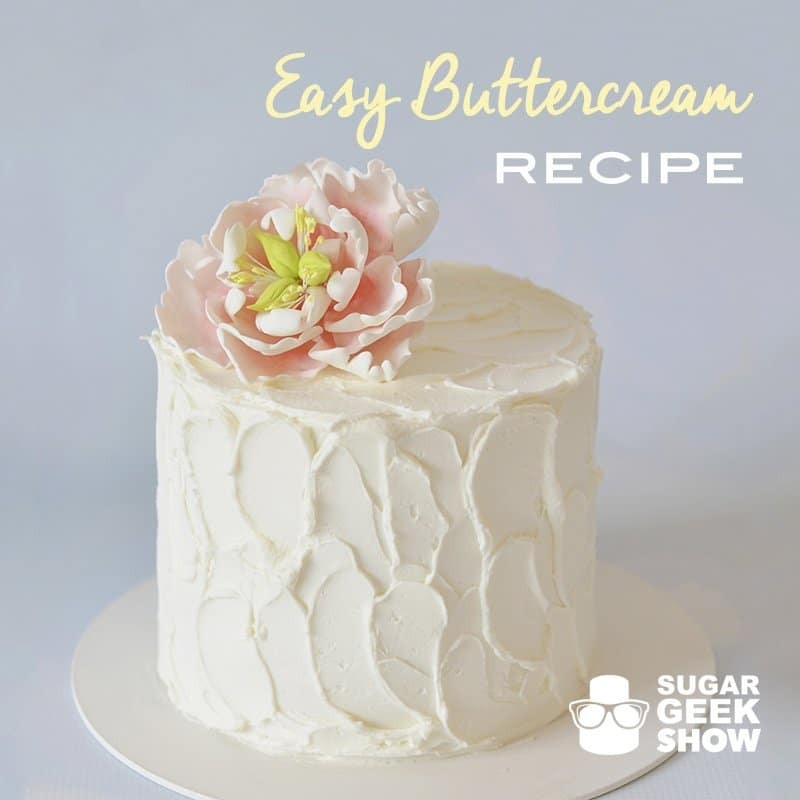 Easy buttercream is much less sweet than standard buttercream. If you don’t want anything sweet you can try using whipping cream but it’s not as stable of course. I’ll be trying this out today, making a neighbor’s birthday cake (though I’m weirded out by the egg whites)! Would you prefer to pair this with your White Velvet cake or use your cream cheese BC? So I made this today… I’ve never seen a frosting so smooth! It’s kind of dreamy… 🙂 Thanks Liz. When you say “pasteurized egg whites” are you talking just from the store, separated from yolks? Raw egg whites? May be a silly questions but maybe Im missing the product you use…thanks! Yes the egg whites in a box are pasteurized which means they are already heat treated and safe to use. I’ve never understood myself what people mean by pasteurized egg whites. I’ve only ever seen eggs at the grocery store in a carton where you separate the yolks and whites. I’ve been scared to try anything like this for fear of salmonella poisoning. Haha that is exactly how I felt when I learned about this recipe!! It’s such a life saver! 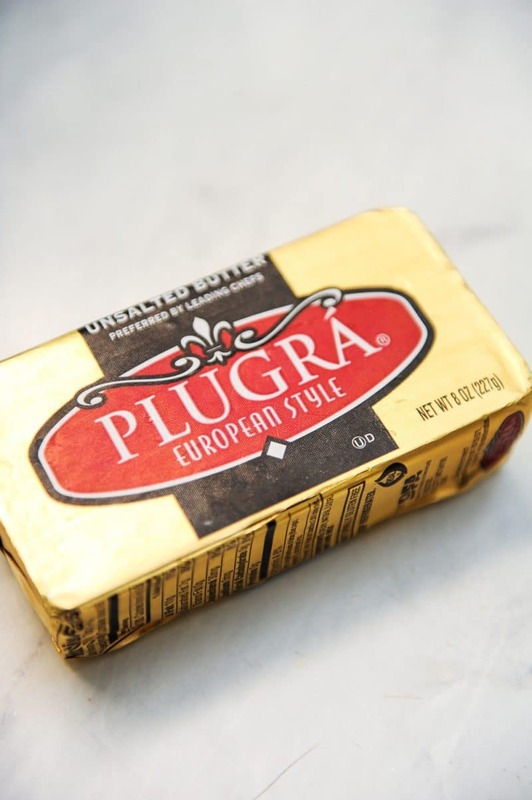 Do you always use the Plugra butter or do you combine it with another brand? What kind of buttercream do you think will hold up best in heat and humidity? easier than making Swiss bc! Easy recipe that everyone loves! This is my favorite buttercream recipe ever, so easy and so delicious, it’s my go to, and I use it most of the time! 💞💞Thank you Liz!!! I struggled using crusting buttercream for so long! I thought smooth sharp edges were make believe. I was a too frightened to attempt the swiss buttercream, and then I tried this recipe… I’m pretty sure angels were singing as a major aha moment occurred! It is so easy to make which I so need in my life, and it goes on like a dream!!! Thank you so much Liz!!!! haha I’m so happy to read this! I felt the same way the first time I used this recipe! Like omg, this is what buttercream is supposed to be haha! 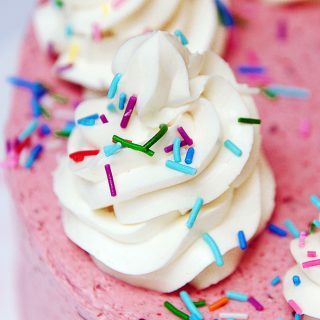 I’m in love with this buttercream recipe. Easy to measure, easy to make and it’s so smooth, fluffy and mildly sweet. Super awesome! I made this for the first time yesterday, and I’m so impressed! The taste and texture are beautiful, and the recipe is EASY!!! It takes some time (definitely take the extra step with the paddle! ), but it’s mostly hands off with your mixer doing all the work. I’ve always liked “bakery buttercream” with half butter/half shortening, but this may be my new go-to! I usually make smbc, but this version looks really good, and easy! What would you say the difference is in taste and texture compared to smbc? In the video it looks less shiny and more matte than the smbc. Thanks! Exactly the same 🙂 I used to make traditional SMBC in pastry school and I literally cannot tell the difference. Can you use meringue powder for this instead? Hi Liz! I soooo wanted to try this, but when I was at the market to pick up the egg whites carton, the carton indicated that since the egg whites were pasteurized that they wouldn’t whip up. So, I was uncertain and didn’t pick the egg whites up :/. Is this a firm buttercream? Do you use it for damming? Thank you! Hey Ann, you don’t need to whip these 🙂 Just combine egg whites and powdered sugar and make basically royal icing then add in butter. Watch the video 🙂 I use it for everything! Thanks for your reply! Will give it a go! Hi Liz…wondering if you can help. Just made this, but it’s literally a soup consistency. I followed everything to the “T”. Any suggestions on how to salvage it? Maybe it’s just too hot in your room? Same here! Looked fine after whipping and then turned soupy after using the paddle for 15 min. It is not hot in my kitchen at all. Not sure why?? Frustrated that I used 4 whole sticks of butter and it’s wasted! Is it possible to over mix this? I followed the time correctly. 4 sticks of butter is not enough, the recipe calls for 2 lbs which would be 8 sticks of butter. When I cover the cake in fondant for this recipe do I need to put it back in the fridge to keep from melting? When using this buttercream and fondant how do I store the cake? I tried this buttercream last night and was surprised at how loose it was. I did a crumb coat and refrigerated the leftover to frost my cake today. When I took it out of the fridge it was like ice cream consistency so I thought it had thickened up but when I whisked it to help it soften and added a little gel food coloring it became quite runny and almost looked separated. I tried to put it in a piping bag to make flowers and it just ran everywhere! Do you have any thoughts on where I might have gone wrong? I am in an air conditioned house set to about 75 so it shouldn’t be too hot in here. I like the flavor but can’t do much with runny frosting! Thanks in advance for your help. I usually use ABC and decorate the night before I need it. If I use this recipe, is it ok to leave out over night or does it need to be refrigerated? I was so happy when I came across your YouTube site. You are an amazing artist! Can I use this with a mirror cake? Thank you for sharing. No more wasted egg yolks! I made this last night along with your chocolate recipe. FYI…I put 1 lb powder sugar because I ran out of sugar. Lol! Still delish! Thank you for sharing your recipes. Love your work. It’s the best isnt it?? I am not sure what I did wrong. I made this buttercream today, but it is very soupy. I am not sure what I did wrong. I put it is the fridge and it got hard, but when it came back to room temp it melted. Is there a way to recover it. However, it is so delicious!!! Thank you in advance for your time. Hi Liz, thank you for your response. I think my butter was too soft when I made this and it has been hotter than normal here in sunny San Diego, CA. I use the butter from Costco. Do you think that could be an issue as well? I am going to try this again in the next week, because the taste is amazing and although it was like melted ice cream, my husband could not stop eating it and he is my biggest critic. I also used it as a filling in a small cake and iced with white chocolate ganache. I took it to work, but kept it refrigerated until serving it to my work peeps, but it went very fast and it did not have time to even come to room temp before they demolished it. They also loved it. I will let you know how the second attempt goes. I’m making this for my birthday (tomorrow! ), and I had quite the struggle with the vanilla cake 😅 (3, 6″ layers and they stayed almost liquid for sooo long, I ended up baking them another almost 20 min–and now they seem like cornbread, so i majorly messed up there) BUT this frosting is amaaaaazing and I’m giddy happy with the taste and look and everything! When you say to “bring it to room temperature and re-whip it” (after chilling), do you mean we should use the whisk attachment, or the paddle? Thank you SO much for your amazing site and self! I have a lot of problems with SMBC cracking once it’s chilled will this one act the same way ? Liz, the last couple of times I made this frosting, it was great when chilled, then melty soft when set out for presentation at room temp. I used good quality powdered sugar, C & H cane sugar. The unsalted butter I used was store brand, thought it was ok as it listed with same fat % as the higher cost butter did. I wonder if the butter is what made it so melty, as in my grass piping on side of cake fell off during the happy birthday song! What would the Sugar Geek do in this frosting dilemma? It could be it’s just too hot in the room and I always chill the cake before delivery. Hi, I just made the EBC. I’m from Holland and we don’t use cup either., but of course I have all the measurements, so put my cup on my scale and poured in the egg whites. 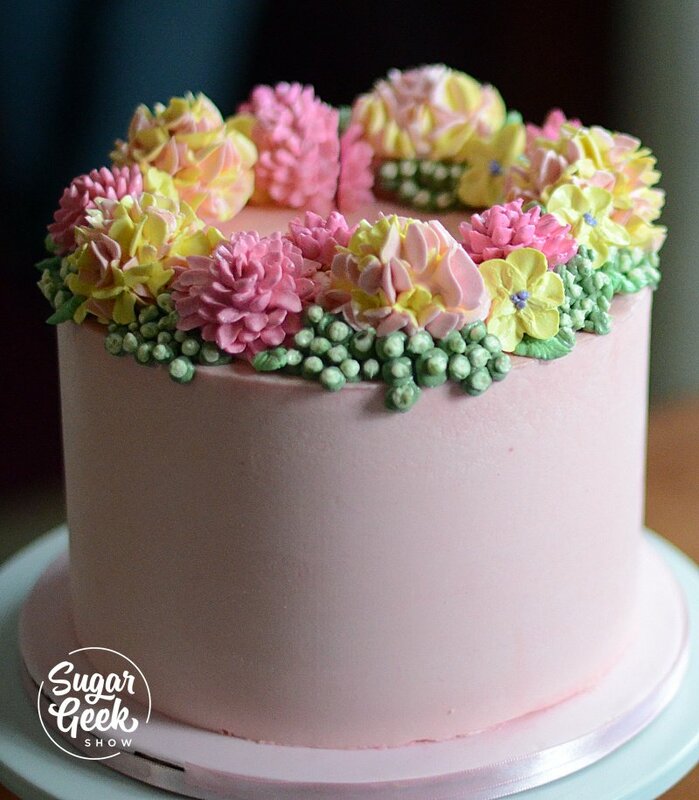 Is this Easy buttercream sturdy enough to hold fondant decorations? Thank you for all your help! I really want to try this recipe but I’m afraid it will melt here in Phoenix. The cake is for a wedding. I believe it will be inside until it’s ready to be cut. How stable is it in the heat? If I want to sub some of the butter for high ratio shortening how mush would I switch out? Thx! Can this be used the same day it’s made? It’s states that you need to remix the next day for 5 minutes so was a bit confused as to whether it could be used the same day it’s made or not. Wow made this buttercream for a cake today and it was a hit at the party. There was nothing left. Thank you soooooo much for sharing. Yay! That’s always a great feeling! This recipe didnt work for me u fortunately. It was not thick enough. I normaly use the 1-2-3 recipe and that works fine. This is a compleyely different recipe. I used 1 cup of eggwhites, 2 lbs of sugar and 2 lbs of butter, just like the recipe says. It turned out yellow and soupy. Shouldnt it be 1 cup of eggwhites, two cups of sugar and 3 cups of butter? I assume you add the vanilla and salt with the powdered sugar and egg whites? I forgot to ask you how many cups does this batch of buttercream make? Hello are you a able to paint on this buttercream? What about air brush painting? Is that fine? Wonderful frosting! My question is related to freezing frosting. I want the very smooth frosting (so I’d do the extra 15min on low with paddle. When I bring back to room temp I would rewhip with whisk, then 15 min on low with paddle right? To half it, would you recommend straight halving or are there any adjustments you recommend on the measurements? Hi, when do you add the vanilla and salt? If I substitute 1/4 of the butter for shortening, do you think it will hold up better for an early evening outdoor wedding – supposed to be about 70 degrees. Really want to try rather than the standard American that I always resort to (for kids bdays). Will this frosting come out stiff enough to layer between joconde cake layers? …or will it flatten out? Would you add any other flavoring to the Joconde and buttercream? 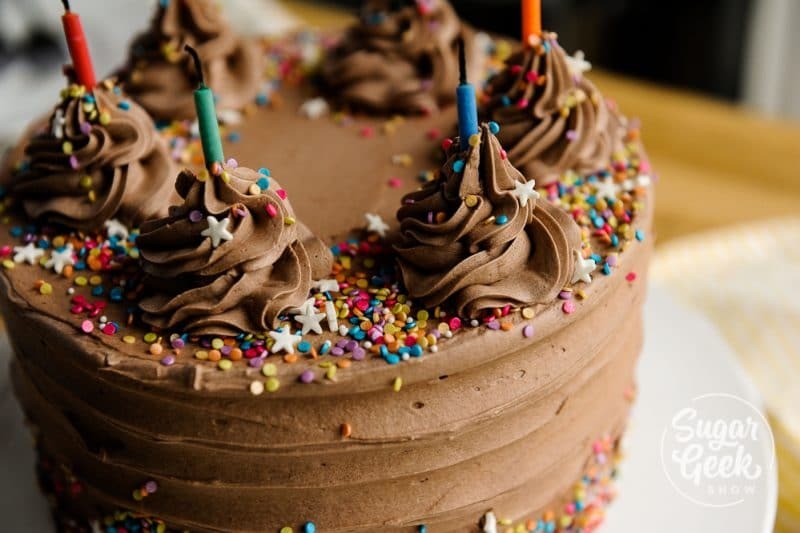 Can you airbrush this buttercream? (Water based) And/or color with gel food color? If not, what type of buttercream would you recommend? I love the recipe and taste, thank you for sharing this amazing recipe. I have one question I can freeze for six months and how long in the fridge? Thank you. Sorry, let me correct my question, I have my butter cream frosting in the fridge, which I made 2 weeks ago (not in the freezer), can I still use it for a cake this weekend? What is the shelf life of this frosting if it’s left at room temp? This recipe gives me life! love it Thank you!! !